Peel and remove core from avocado. In a medium bowl roughly crush avocado with a fork. Mix in the yuzu juice, sesame oil, spring onion, tomato, sour cream, TABASCO® Sauce, salt and pepper to taste. Cover with cling film placed directly on the avocado mix and place in the fridge. Preheat oven to 350F. Cut the tomato vines into 5 tomato pieces, and place on a foil-lined tray. Place the garlic with the tomatoes and sprinkle the olive oil, salt and pepper to taste. Place in oven and cook for 5-6 minutes until the skin of the tomato just starts to split and break open. Remove from oven and set aside. Take the toasted sourdough slices, and spoon on the avocado spread on top. 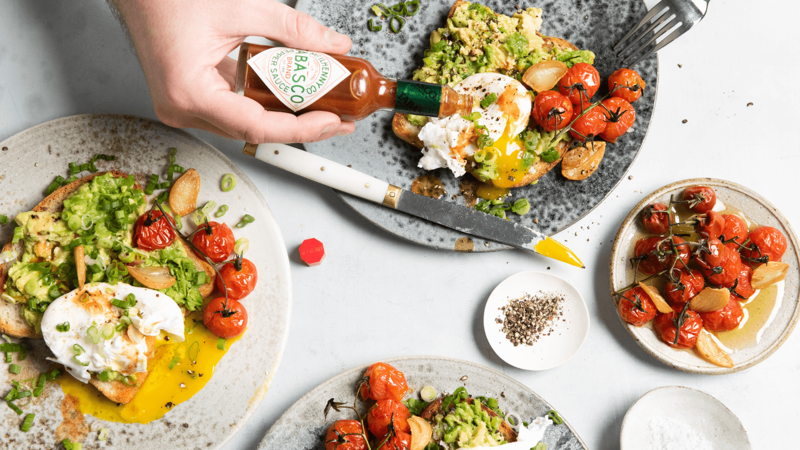 Place the vine tomatoes on top of the avocado, and the poached egg next to it. Finish with salt and pepper. Serve immediately. Fill a saucepan with boiling water and bring to a simmer, about 350F. Add 4 tbsp white wine vinegar and a pinch of salt. Crack the individual eggs into small ramekins ready to poach. Just before cooking stir the water to make a whirlpool effect and gently add each egg. Cook for around 2 minutes for a soft yolk and remove with a slotted spoon.